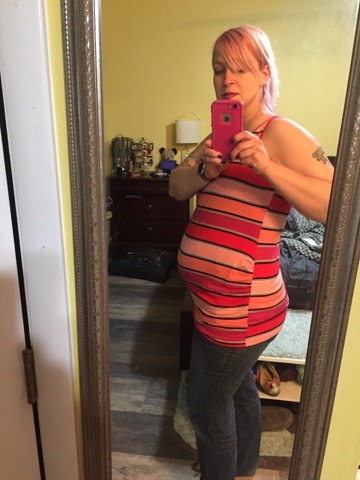 Well, closing in on 6 months of pregnancy and I'm still pregnant! It's been.. rough. The first three months are something I never want to repeat ever again. I keep looking at women with more than one child and I just want to grab them and ask "WHY??? Why would you do this to yourself AGAIN?" Don't get me wrong, I'm beyond grateful that I'm pregnant. But I am not an easy puker. I am the kind of person who fights getting sick with everything I have. So spending three months gagging whenever I ate food, smelled food, thought about food, or slept, or took a deep breath... I would not want to go through that again! 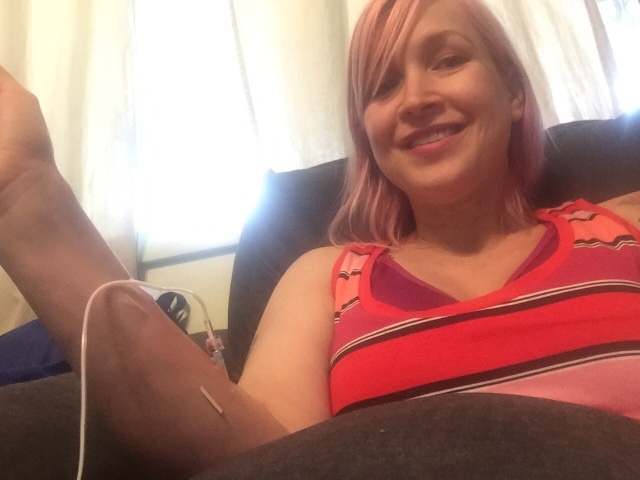 I had my last infusion treatment! With the progesterone done as well, this means I'm down to two IVF drugs left, and only one of which involves needles! (Twice a day needles, but still, better than 3 or 4 times a day needles!) My stomach, incidentally, is a solid shade of yellow, with black and blue patches all over it. 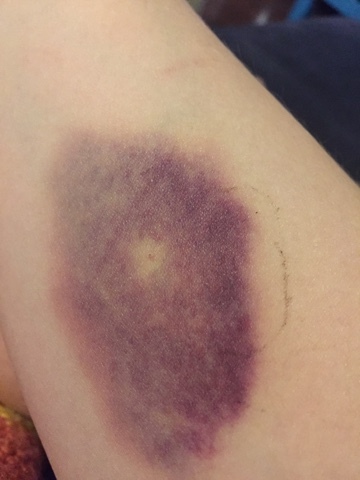 One giant bruise. It's completely gross. I won't finish these shots until October, and I can't imagine how much they're going to sting as my skin keeps stretching out! It was a very rough IV this time. Took 3 pokes, and this is the result of the "good" one. Every single time I graduate out of an IVF drug I'm convinced I'm going to lose the baby. Hell, 6 months in and I'm still convinced every time I go to the bathroom I'm going to realize I'm having a miscarriage. I fear I'm going to be the most anxious mother on the planet. "Are you going to get a book off the shelf dear? Don't forget your helmet!!!" My poor doctor. Whenever I go in for a checkup I'm in anxious tears until I hear the heartbeat, because I'm convinced that this is the time it's going to be gone! She's gotten good about calming me down, and honestly, now that I can feel the baby practicing her boxing skills a few times a day I'm a little more convinced that she's actually REAL. I tried to explain to someone, after years of "yes! This is it!" only to have the other shoe drop.. I'm still waiting for that bad news. We did our genetic blood test, everything was fine. 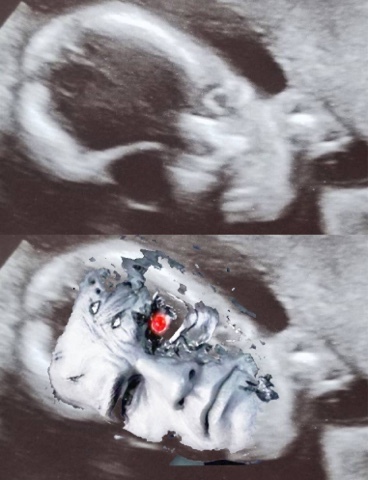 We did our ultrasounds, everything was fine. So I really just need to learn to relax. My friends who have had normal pregnancies keep scoffing and rolling their eyes at my anxiety. "What do you mean you won't drink a little wine? It's fine! I drank and my kid is okay!" Or, "You don't HAVE to sleep on your side! Just sleep on your back if that's the way you like to sleep!" And they don't understand why I won't. I think a lot of it comes from our infertility being "my fault". Which means that if something goes wrong, I don't want it to be "my fault" again. Totally unreasonable, emotional and without logic? Absolutely. Welcome to my pregnant brain. We got our first pictures of our kids face. We've decided that she's obviously a terminator. Also as I've mentioned, I've felt the baby move! It's so weird! A lot of times it feels like bubble wrap popping in my stomach. But sometimes I feel a big roll. The other night I had my hand on my stomach and actually felt her MOVE MY SKIN! I screamed and held my stomach, waking poor Dill up in a panic. Have I mentioned that Aliens was my absolute favorite movie? (Huge crush on Michael Biehn as a kid) I honestly watched it almost every day one summer. I keep expecting the skin on my stomach to burst open. I promise I have a life outside of pregnancy as well. Or at least, I'm getting one back. Again, first 3 months I was a miserable, gagging hermit. Now I'm able to be upright, to knit, go out (sober), hang out with friends (sober) and go to restaurants (sober). Non pregnancy updates coming, including information about my upcoming Gen Con events!